With all the flight restrictions its a bit nerve-wrecking to pack for a plane trip. And I hate to welcome food into my car if its likely to be messy, so before trips I work hard to find foods that are acceptable for security, acceptable for my car and, of course, acceptable for my kids’ health. 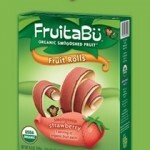 FruitaBu’s Smoooshed Fruits are the favorite amongst the clean and healthy snacks. There’s a real depth to the flavor and, a bonus for moms, there is never a mess in these flat fruits and rolls. Easy and fun to eat, they’re healthy and made naturally. We’re big fans of Kashi. Their Heart to Heart cereal in Honey Toasted Oat offers flavor to the healthy bites (and cute little heart shapes, too.) Its great for breakfast or a dry snack on-the-go. My kids would prefer to eat a TLC Bars over cereal though. Their favorites include Dark Mocha Almond Chewy Granola Bar, Pumpkin Pie Fruit and Grain Bar, and every option of the GOLEAN Crunchy! Bars. But overall, my 4 year old loves the Blackberry Graham TLC Cereal Bar best. And, while I love cooking with their Pilafs, I’m just happy they like Kashi because I’m confident they’re eating healthy, well produced foods. Finally, I was sent a sample of Popchips. Now, I’m not a potato chip person. I’m one of the people that gives you her free bags that come with sandwiches and leave the chips on the plates. Chips, in general, are too salty. But what I really don’t like about them is that they stick to my teeth. Hate that. That said, I still tried out Popchips. And, honestly, I liked them. Its like that old Mikey commercial. No one could believe I was eating Popchips. But they were harder than the normal chips, didn’t stick to my teeth as much. And the salt was more balanced in the flavor. We tried all of the flavors and, while my favorite was Barbeque, I also really liked Parmesean. The kids loved orignal and cheddar potato. 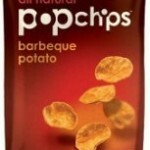 So, I never send chips to school in their lunches, but I did send popchips! They’re all natural and they’re made by popping, not baking or frying. So less grease, less fats. Just less. But lots of flavor. Thanks to the parent companies and their agency for sending samples for testing. My kids love the smooshed fruit too. Plus it’s just fun to say!